Divine providence. Manifest destiny. American exceptionalism. These are all terms bandied about in the political arena today. There is no debating that many of our Founding Fathers invoked “nature’s god” and “divine providence” in their writings. Is America exceptional? Is there a plan for this country ordained by God himself? Do the actions of citizens invoke God’s favor or His wrath? Conservative Christians have made the same arguments for decades and sadly, many of the issues facing our country are worse — not better. 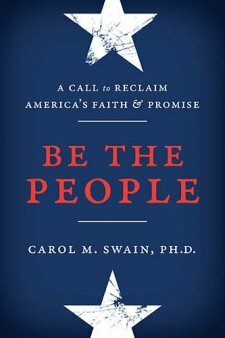 The best point of Carol Swain’s book is that we each have the responsibility to know our beliefs and to know our history and our founding documents. As a society we have abdicated our role as the keepers of that for which our Founding Fathers fought and died. You may not agree with Ms. Swain’s conclusions but as an American you cannot disagree with her methods…know what you believe (can we at least agree on the Ten Commandments? ), know what the Constitution, Bill of Rights and the Declaration of Independence have to say about how things should be done.